Just Catamarans was recently at the 2018 Cannes Boat Show, a show that featured many debuts, including the new Sunreef 80 Catamaran. Sunreef recently had a 74′ Sunreef Sailing Catamaran and a 40′ Power Catamaran Diamond Edition on display at the Fort Lauderdale Boat Show (October 31st – November 4th). Check out the following review by Risa Merl of Boat International on the first Sunreef 80 Catamaran ever made: 7X Split. They say less is more, but sometimes more really is better. The owner of the first Sunreef 80 sailing catamaran, the 24.4 meter 7X Split, is an avid sailor who had owned only monohulls previously. Before he became a catamaran convert, he was craving more room but he didn’t want a motor yacht and had never seriously considered a multihull. The latter was key. If there was a big sacrifice in sailing performance in exchange for comfort, then it would not be the perfect solution after all. Though it wasn’t a Sunreef that he saw that day at the boat show, 7X Split’s owner did his research and had the good fortune to contact the Polish builder just as it was embarking on a new line-up of performance-cruising sailing cats, designed to deliver that ideal blend of luxurious comfort and sailing acumen, spanning 50, 60 and 80 models. Designed entirely in-house at Sunreef, this new range of GRP-built multihulls would be all-around sailing yachts, equally adept at cozy coastal charters and transatlantic adventures. 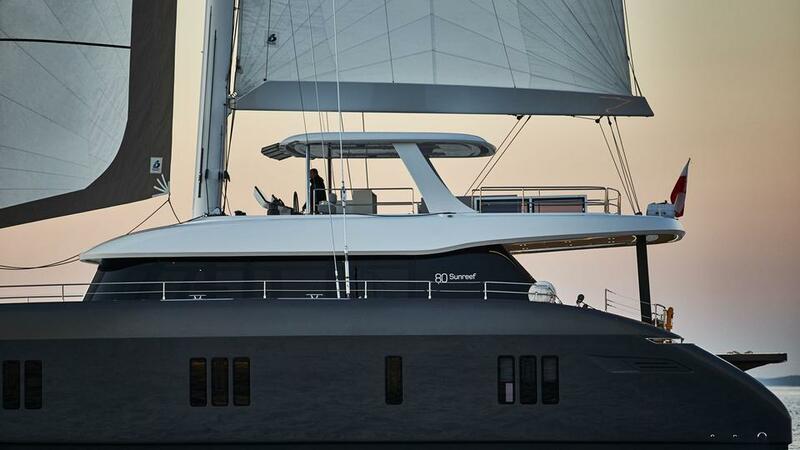 He scooped up the first hull of the new Sunreef 80, which later made its debut at the builder’s Pomorskie Rendez-Vous held in Gdansk, Poland, in June and later premiered worldwide at the Cannes Yachting Festival. 7X Split has a maximum beam of 11.5 meters and 340 square meters of living space. The spacious cabins in the hulls feel more like those on a motor yacht. 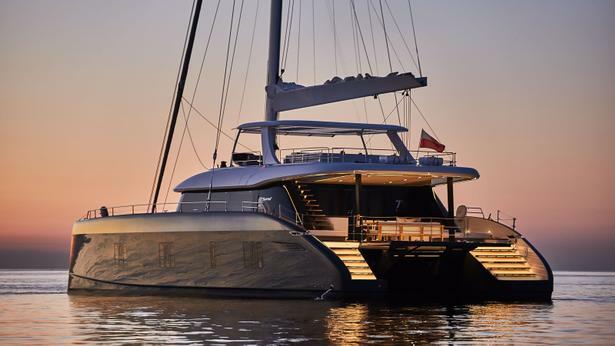 A common complaint about catamarans is high beds, accessed by steps, and the brief for the Sunreef 80 series included step-free cabins – so beds are low and enjoy views out of portholes that dip down to the water. “[To achieve this] we raised the level of the floor in the hulls,” says Bliźniuk. The owner of 7X Split gave a simple brief: it should include a huge master cabin, utilize as much space as possible inside and out, but not be overstuffed with furniture. He opted for the four cabin layout, one of the eight options offered by the builder for the 80, though each can be modified. The master suite and children’s room are to starboard, while in the port hull there’s a galley and two double-berth guest cabins. 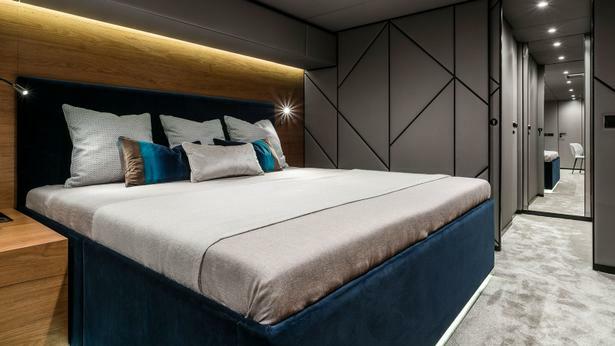 7X Split’s master suite takes over most of the starboard hull. 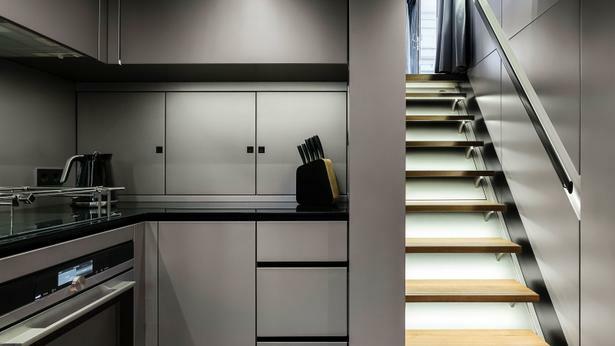 There are two entryways, through a standard hallway and via a “secret passageway” in the walk-in wardrobe, which itself is hidden behind a custom-designed decorative wall. The master and guest cabins feature greys, deep blues and leather detailing. It could have been a bit dark, but a trio of rectangular portholes bring light into the space and a reflection of water dances across the ceiling. A sofa and desk complement the queen-sized bed in the master, and the en-suite carries forward the masculine interior motif, adorned in teak and dark quartz. There’s an option for a balcony to fold down off the master, which has been engineered but not yet sold on an 80. 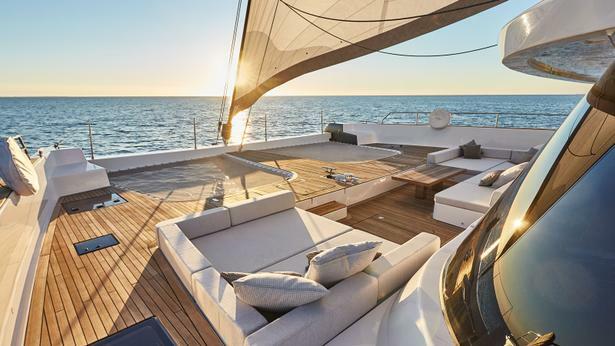 “On board some of the next units from Sunreef 80,” says Joanna Szulc, Sunreef’s head of interior design, “we will see the galley up [on the main deck] and galley down, four and five cabin layouts, an extra bar section on the main deck, and many other options. Everything is possible.” The yard does its own naval architecture, interior design, joinery and even carbon work, like the 33-meter mast the 80 carries. Sunreef prides itself on the level of personalization that it is able to give customers, and the designers say they worked closely with 7X Split’s hands-on owner and his wife throughout the build, including creating custom elements. One of these was the onyx island that’s a focal feature in the ample 47 square meter main saloon. Cut with asymmetrical angles and backlit, the white onyx piece is set center and forward in the saloon – it holds a television while also concealing bar storage at its rear. The saloon furnishings are simple and clean, and kept low to take in the views from the large windows. The deep, L-shaped sofa to starboard has reclining backrests and is set off by circular, mid-century-inspired coffee tables and leather chairs. To port is a dining table with a shallower sofa on one side and four elegant white chairs on the other. Throw cushions in ocean tones break up the grey and neutral colors of the furniture. The saloon can be rearranged to suit just about any use the owner desires, from disco to conference room to yoga studio. 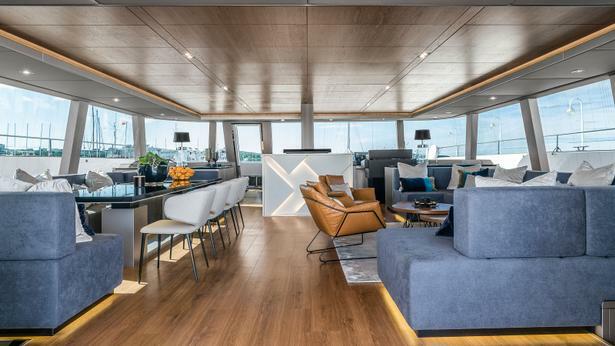 With the doors flung open fore and aft, the entire main deck – which is all on one level – becomes a glorious indoor/outdoor living room, stretching from the bow lounge to the aft cockpit. The tender platform gets in on the act, too. When the Williams Sportjet 520 tender is launched, the platform rises to deck level and extends the available living space, hosting furniture, like the hanging basket chair that’s on board. This platform is customized to meet the yacht owner’s needs, and Sunreef has three options that are able to lift 800kg, 1,000kg or 1,200kg. It also lowers to water level, creating a large swim platform. “A high level of customization is also found on the flybridge, which can be fitted with a grill, bar, spa pool, sunpads and a mini gym section,” says Szulc. 7X Split’s flybridge speaks to how the owner will use the boat, with a dining area, sunpads, bar and dual helm stations. 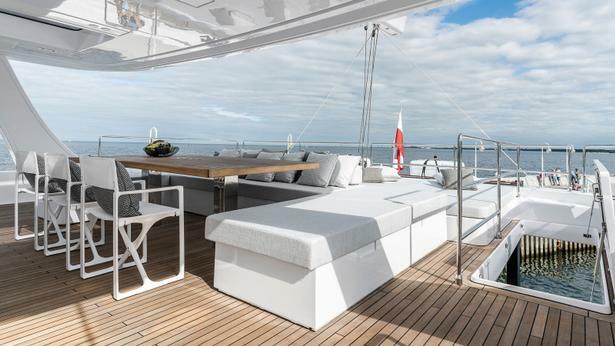 Between the flybridge, huge bow lounge and cockpit, the owner has plentiful outdoor living options, far more than he ever had on his monohull. It will have nearly 400 square meters of living space, which is huge compared with a monohull of the same size. The sporty powercat is defined by its generous use of glazing and a main deck master, lit up by skylights, that opens on to a full-beam bow terrace. 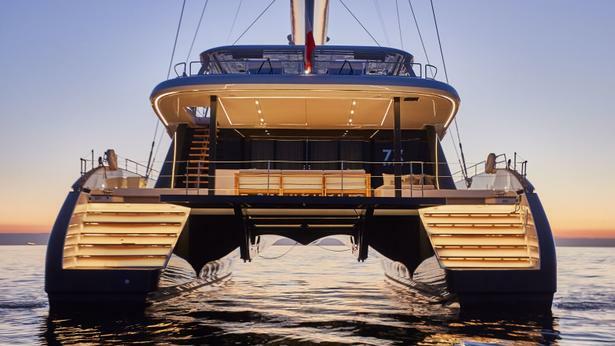 Her aft cockpit will feature movable furniture that can be adjusted to look inwards or out to take in the sea views. The composite-built 80 Power will also have a garage and aft platform, affording storage for a tender, jet ski and myriad water toys. Hull No 1 is already sold and in build, and she is due to be launched in October 2019.